Our Frankincense premium gift set includes four votive candles and a diffuser. Part of the Parks Premium Gift Set Collection, the deep scent of frankincense is enriched with bright bursts of orange and fresh notes of patchouli. Warming and calming, this luxurious gift scent creates a cosy atmosphere and makes a delightful gift for loved ones. Our premium gift set will instantly soothe your senses with its comforting and warm scent. Get cosy and enjoy the aroma as notes of frankincense blend beautifully with the delightful scents of orange and patchouli. Described by many as the scent of Oman, frankincense is deeply established in the culture of the Middle East. This fabulous home scenting set is presented in our gorgeous luxury gift box and will certainly make a lasting impression. Featuring four votive candles and a luxury diffuser, our luxurious set gives you the option to fill your entire home with the fragrant aroma of frankincense. Surrounding your home with a cosy fragrance, this premium gift set provides scents that your family and friends will love. With each candle offering up to eight hours of burning time, and the diffuser providing fragrance for up to six weeks, you can savour the rich, warming scent for many months. 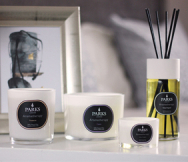 If you’re looking for a gift for that someone special this winter, it’s got to be a luxury scented gift set from Parks London.